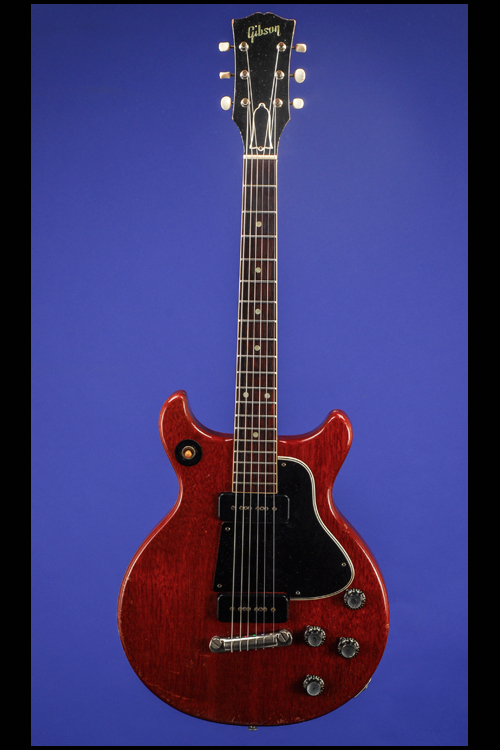 Les Paul Special 3/4 Guitars | Fretted Americana Inc.
1959 Gibson Les Paul Special 3/4. This very rare guitar weighs just 7.30 lbs. and has a nice comfortable nut width of 1 9/16 inches and a three-quarter Gibson scale length of 22 3/4 inches. 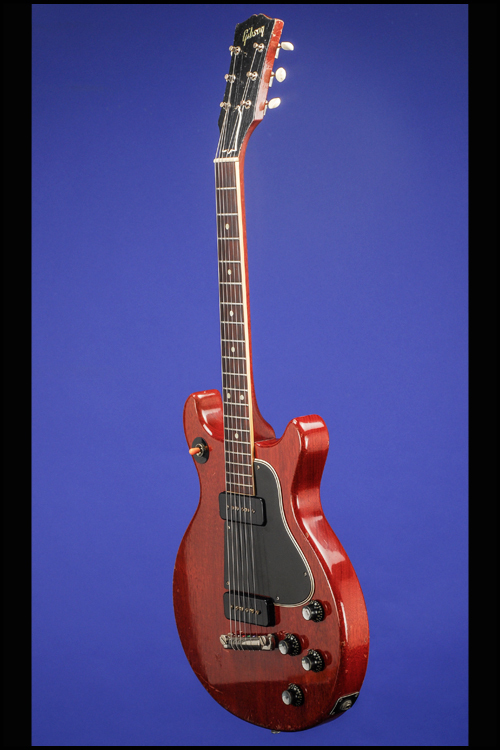 Solid mahogany body, one-piece mahogany neck, and bound rosewood fretboard with 19 original jumbo frets and inlaid pearl dot position markers. Headstock with inlaid pearl "Gibson" logo and "Les Paul Special" silkscreened in gold. Closed-back "single-line" Kluson Deluxe strip tuners with white plastic oval buttons. 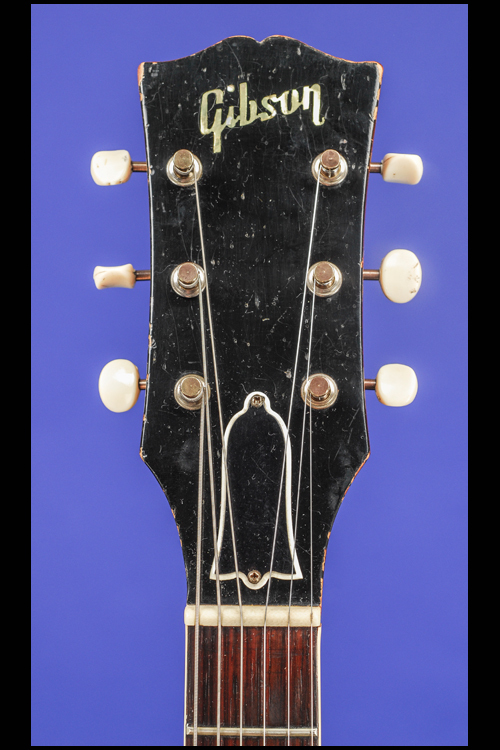 The serial number "922529" inked-on in black on the back of the headstock. Two-layer black over white plastic bell-shaped truss-rod cover with two screws. 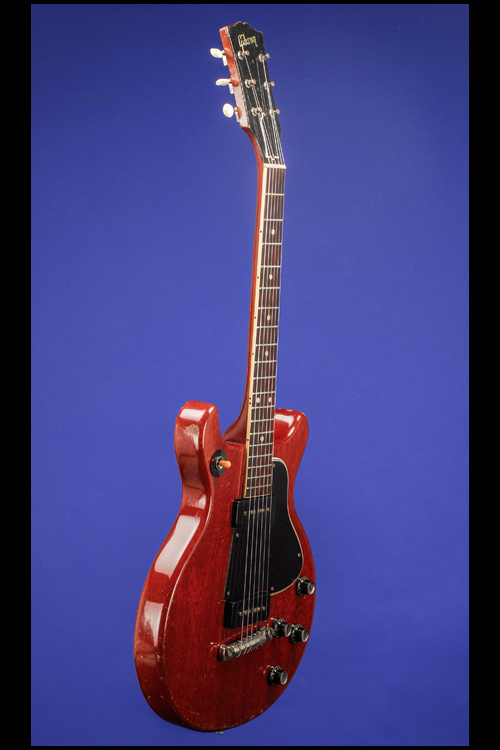 Two P-90 pickups with outputs of 7.58k and 7.70k. Two original black plastic pickup covers, each with "UC-452-B / 2" stamped on the underside. Five-layer black over white plastic pickguard with five screws. Four controls (two volume, two tone) on lower treble bout, plus three-way pickup selector switch surrounded by a thin black plastic ring engraved with "RHYTHM" and "TREBLE" on upper bass horn. Black plastic bell-shaped "Bell" knobs with metal tops. The potentiometers are stamped "134 936" (Centralab, September 1959). Combination "wrap-over" bar bridge/tailpiece. 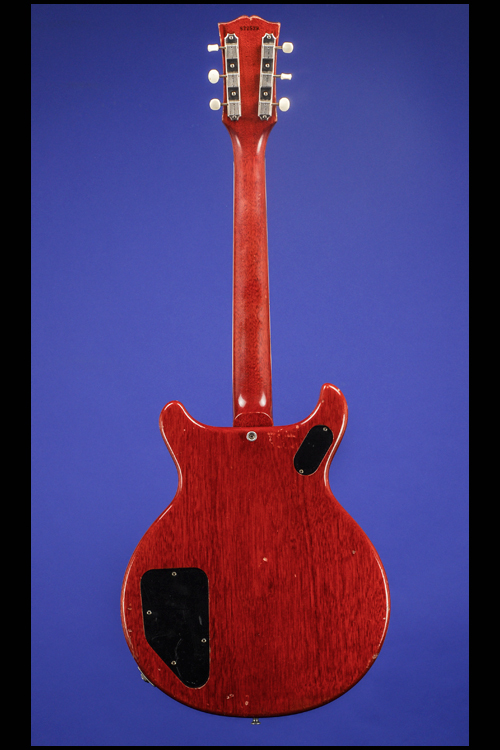 This guitar is in exceptionally fine (9.00) condition, with only a few very small marks on the body, mainly on the edges - the most significant being on the side of the bass horn. 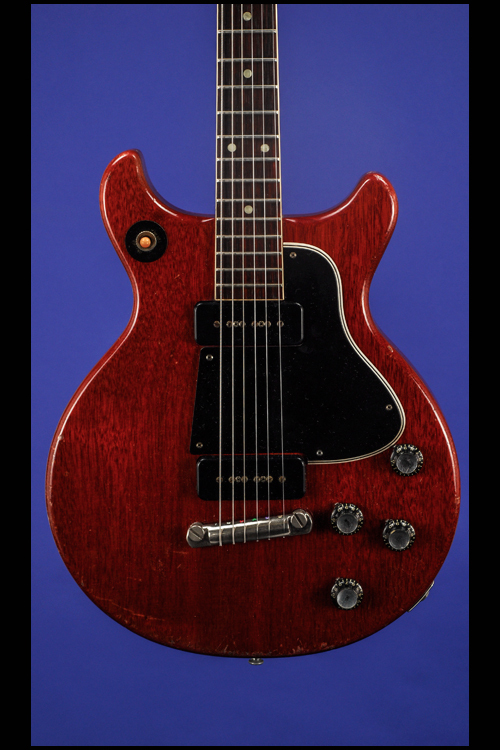 This is an exceptional example of one of only 12 "three-quarter" Les Paul Specials made in 1959 out of a total production run (up to 1960) of just 51 guitars. 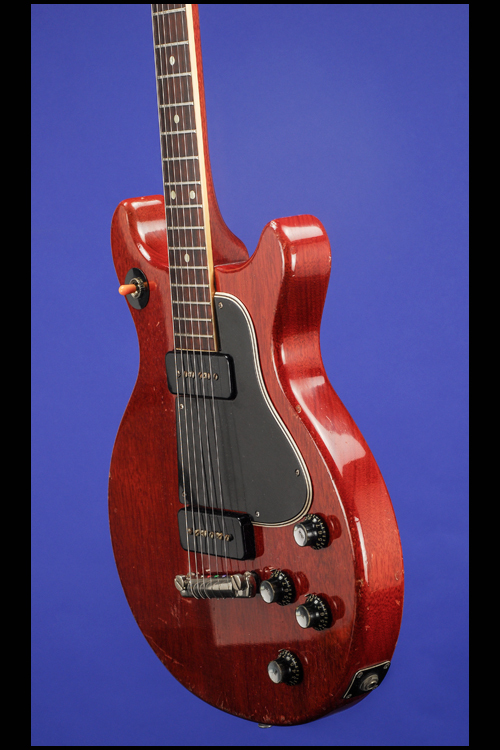 Housed in the original Gibson three-latch, shaped brown hardshell case with pink plush lining (9.00). 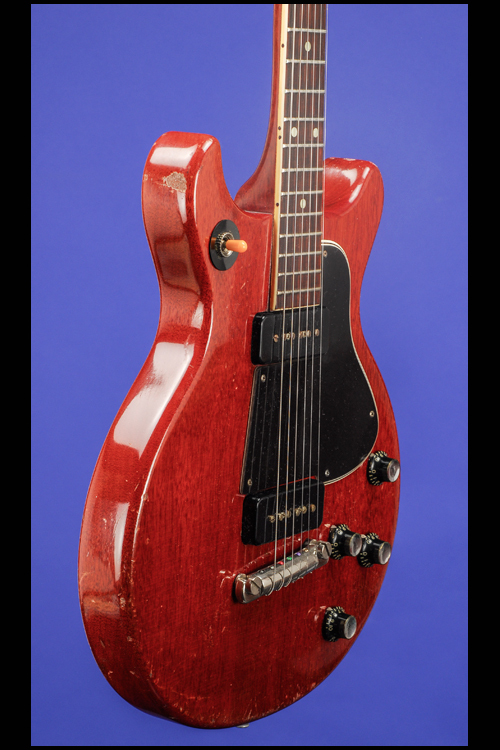 "In late 1959 the SG designation also heralded the advent of a 3/4 size version of the Special, built along the same lines as its Junior counterpart. 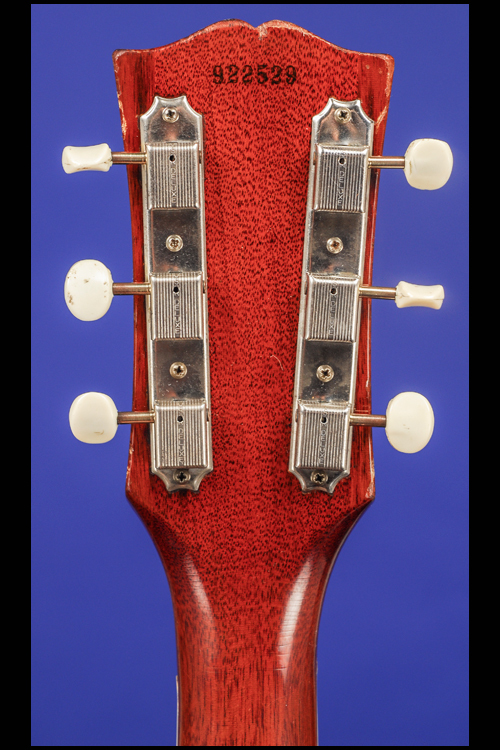 The shorter 19-fret neck is sunk deeper into the body and the bridge-tailpiece is anchored nearer the bottom edge. This left little room in the controls' area to accomodate the toggle switch which was consequently relocated in the upper cutaway horn. The 3/4 size Special was a flop, and several instruments made in late 1959 were eventually dumped in mid-61 to clear all existing inventory. For example: #922392/407/525/530/533/535/539 registered on 29th August 1961." (A.R. Duchossoir, Gibson Electrics -- The Classic Years, pp. 211-212). In spite of being "a flop" in the late fifties/early sixties this little beastie actually does nearly everything that its big brother can do. 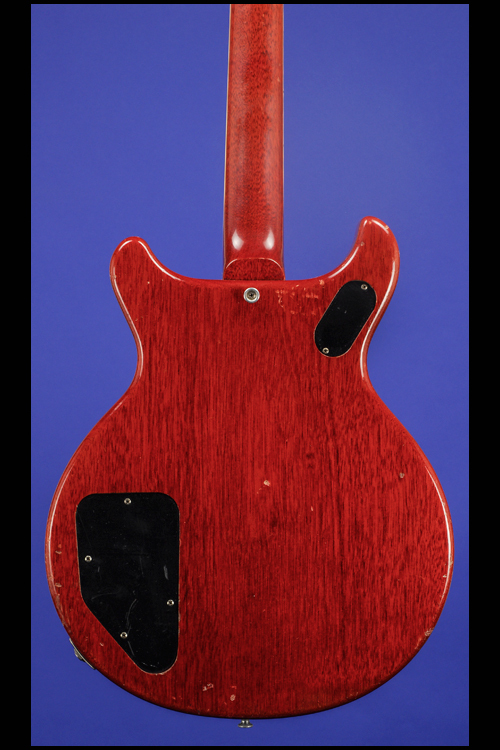 If you have small hands and you you are comfortable not playing beyond the 15th fret -- then this one will give you all the great resonance and gutty sound that you would expect from a '59…and all that at a fraction of the price!